On the 15th of April, HPSH had their Day of Silence. The Day of Silence is for supporting the LGBTQ+ community. To participate in the Day of Silence, you either need a button or a laminated card saying you’re participating in the Day of Silence. About 175 people at HPSH participated in the Day of Silence. I interviewed some of my friends and teachers about the Day of Silence. Why did you participate in the Day of Silence? Grace Sheehan: I wanted to bring awareness for LGBTQ+ and bullying, also wanted to support those who are struggling. Lucy Minner: I have some friends in the LGBTQ+ community and also, it’s for a good cause and everybody deserves equal rights. Beth Kallestad (World History Teacher): I think it’s powerful that as a teacher I didn’t speak because, it made awareness of LGBTQ+ people that were bullied, harassed, or have been called names. Clare Barownlee: I’m an alli of the LGBTQ+ community. I have friends that are LGBTQ+. The way LGBTQ+ impacted and affected my friends became really apparent to me. I think it is important to recognize in the places that affect them most. Berit Depies: I’m in the HPSH Gender and Sexuality Alliance (GSA). I know many who are in the LGBTQ+ community. I participated because the Day of Silence is important. It shows that other people care about those who are struggling. Hopefully, those who don’t know what people in the LGBTQ+ community are going through can learn. How do you feel about the Day of Silence? Grace Sheehan: I support the Day of Silence and the LBGTQ+ community but, maybe not in the exact way the community would support everyone. Lucy Minner: I feel like it went well for everyone who did participate in it. Beth Kallestad: It is important that our school participate in the Day of Silence to make student and staff aware. Also, it shows students and staffs of the LGBTQ+ community know that there are people who support them. Clare Barownlee: I used to think “Why stay silent and not speak put about the issue?”. Over time, I realized that the Day of Silence was really powerful. It was really powerful to see my friends staying silent. Then, I realized that the Day of Silence was really important. Berit Depies: I think the Day of Silence is great even though I did’t know about it until this year. The Day of Silence is really meaningful because the quietness shows and stands out. 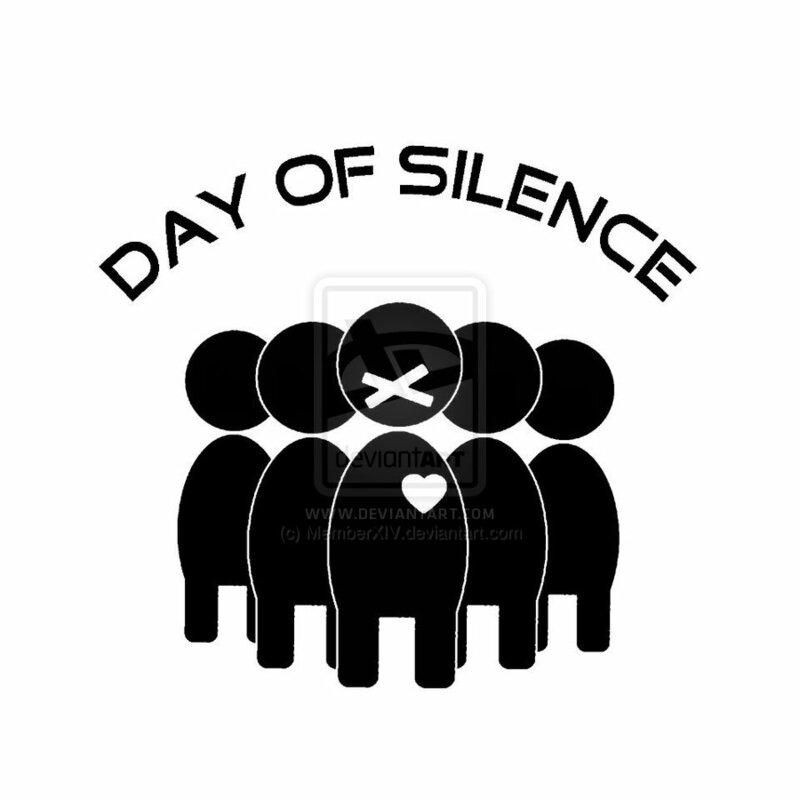 Do you feel like the Day of Silence was good way to support everyone? Grace Sheehan: Yes, it is an easy thing for everyone to do. It also brings awareness because those people who talk everyday are now being silent. Lucy Minner: Yes, even though I slipped up four or five times but if I just kept my head down then it wasn’t that bad. Beth Kallestad: For beginning steps, yes. For a group that has about 20 people, there were more that actually supported than just the 175 that participated. Clare Brownlee: Yes, the Day of Silence is very inclusive. Like, it’s not just the Day of Silence for lesbians or just for gays, but for everyone in the LGBTQ+ community, it doesn’t specify. It’s for everyone who was discriminated against their gender or sexual orientation. Berit Depies: Yes, a lot of people supporting for you is good. What do you like about the Day of Silence? Grace Sheehan: I like what the Day of Silence represents. It shows how many people actually care about the LGBTQ+ community. I just like what it stands for. Lucy Minner: It’s for a good cause as I said earlier. People can realize that there are people out there who are struggling. Beth Kallestad: It is a good opportunity to participate on a social justice and human rights issue. Even if they are not in the Gender and Sexuality Alliance (GSA), it allows students to participate and show support to the LGBTQ+ community. Clare Barownlee: The Day of Silence to me is a way to physically see the silence. Real people are choosing to stay silent and that really stands out. The Day of Silence is a good way to represent that people out there are struggling. It is also a physical way of symbolizing against discrimination. Berit Depies: It is powerful when a lot of people choose to stay silent. Everyone can participate and it also brings a lot of people together. Personally for me, I think that the Day of Silence went well. If we had more people participating, it would stand out more. Back in middle school I was able to participate in the Day of Silence but as of this year, I couldn’t. Hopefully, next year I can also participate to show my support for those who are and aren’t struggling. As someone who identifies as bisexual, it was like those who I interviewed said before, it was very powerful to see. Hopefully, more people will become more aware and can show that they support LGBTQ+.